Elvis is shown between takes at his first RCA Victor recording session in Nashville, Tennessee in January 1956. Elvis Presley tries on clothes in 1956 at Lansky's Men's Store in Memphis. Bernard Lansky's family ran the shop on Beale Street and Elvis bought clothes at Lansky's throughout his career. 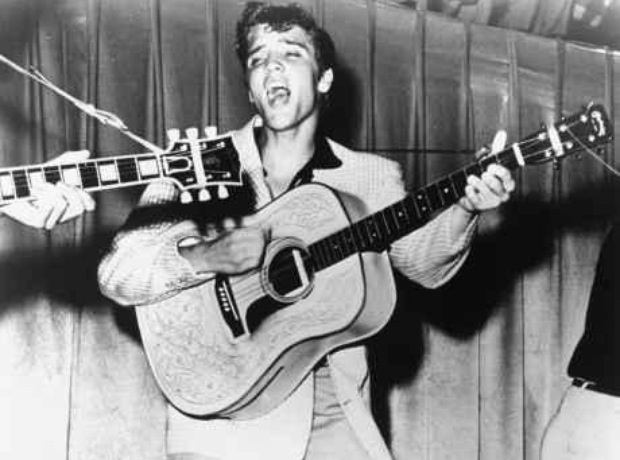 Elvis Presley is shown with his Gibson J-200 guitar in a 1957 MGM studio publicity photo. The King meets the President - Richard Nixon in this case.